Professor Antony Flew and co-author Abraham Varghese have written a book, There Is a God, describing Flew’s “conversion” from atheism to deism. Although Flew grew up as the son of a preacher, the problem of evil and Flew’s academic studies led him to disbelieve in God’s existence. Much of the first few chapters of There Is a God examined Flew’s philosophical writings for atheism and against the existence of God. For Flew, at the time, there just wasn’t enough evidence in support of the existence of God. By default, he reasoned, atheism was the logical choice, and it was up to the theists to present the evidence supporting their case for the existence of God. In all Flew’s writings, it is apparent that the existence of evil is still a problem for him, and that he considers this problem as eliminating the possibility of God being personal. Flew still insists that the free will defense argument does not exonerate God from the responsibility for the existence of evil. However, at this point, I think most theists acknowledge that God is ultimately responsible for evil, but that evil is required to fulfill the purpose for the creation of the universe. 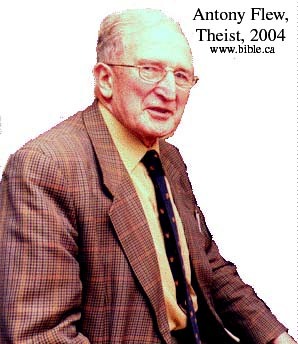 The idea that Antony Flew is not a deist was thoroughly rebutted by himself in his review of Richard Dawkins’s book, The God Delusion.1 In the review, Flew calls Dawkins a “secularist bigot” and chides him for failing to address Einstein’s deism or even properly defining deism anywhere in his book. Such writings do not reflect those of a senile old man.